Please fill out the application below for the Accounting Career Completion Program. SSN Social Security Number (SSN) is not required for admission; however, your SSN is required for other enrollment procedures, such as applying for federal aid and registering for classes. Degree Earned (1) If no degree was earned, put "No Degree"
Degree Earned (2) If no degree was earned, put "No Degree"
Degree Earned (3) If no degree was earned, put "No Degree"
Please affirm the following before you submit your application. I certify that the above information is true and complete; I understand that withholding information requested, with the exception of information designated as optional, or giving false information may make me ineligible for admission and enrollment. By signing this application, I certify that the information given above is accurate. Additionally, I acknowledge that I am enrolling only in courses that are part of the Accounting Career Completion Program and that I am not seeking admission into a degree program at the University of North Alabama at this time. 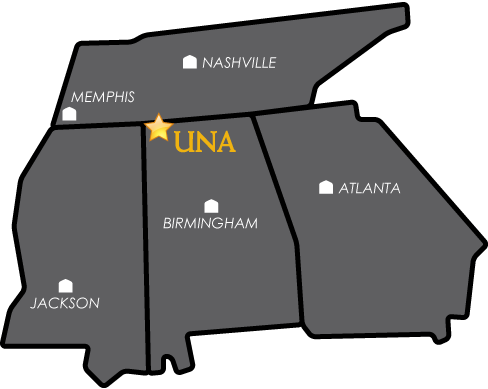 If I apply for undergraduate / graduate admission to the University of North Alabama, I agree to meet the admissions requirements at the time of application. Please follow the link below to remit payment for the course(s) in which you wish to be immediately enrolled. Once your application and payment have been processed, you will receive login instructions and will be able to begin your course(s). Please allow 7 to 10 days.